Welcome to Van Blanc Containers, storage SOLUTIONS that you own, that's SAFE, SECURE and SMART. We offer our expertise and experience to ensure that you receive the best advice and service when it comes to containers and solving your storage needs. We supply custom containers with add on features such as doors, windows, air vents and more! Our delivery service is prompt as we ship containers within 48 hours of requests. 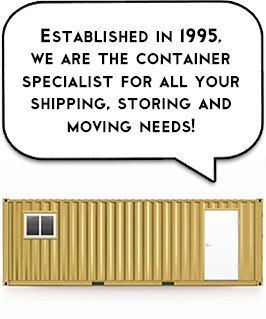 We have a wide variety of containers including, Sea Containers, Rail Containers and more. Serving Southern Ontario, we have all sizes of containers to meet your business storage, shipping and transporting needs! Freight can be arranged to help provide a total door to door service. Shipping containers are a robust, interesting, quick and cost-effective way to put a building in your own yard or place of business! Better yet IT WILL NOT INCREASE your municipal land taxes! In many cases a simple permit is required with a nominal one time fee. Which varies from municipality! (See your local municipality for rules and regulations). Franchise transport owners are located within each city to ensure they can deliver your box locally to your property. Areas of service include: Brantford and the Hamilton area. Other areas served include, Cambridge, Kitchener, Waterloo, Burlington, London, Sudbury, Parry Sound, Woodstock, Huntsville, Sarnia, Chatham-Kent, Windsor and more! VB Inc. is your Ontario container company! Delivering sea containers, shipping containers, commercial use containers and more! We guarantee to deliver you only the best containers that will service your needs! No need to wait, we will respond to your request promptly within 24 hours! We can customize your containers to fit your specific needs with custom sizing, grading, painting, and more.